Print out a coupon for a $1 discount on any Carnation Instant Breakfast Essentials products when you sign up for their breakfast e-club. $2.00 off one box or multipack of Carnation Breakfast Essentials Light Start Nutritional Product. 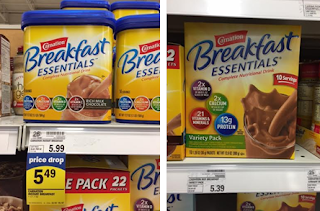 Print a coupon for nestle carnation evaporated milk from very best baking. "Like" Carnation on Facebook to get $2 off any one box, canister or multipack of Carnation Breakfast Essentials Nutritional product.